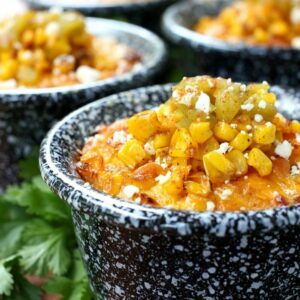 Grilled Italian Street Corn is my twist on a favorite side dish, this corn is cooked right on the grill and topped with my favorite flavors! Summer time always means flash parties around my neighborhood – last minute get togethers that no one really plans but just seem to come together. I guess it’s because everyone is outside more, doing yard work or exercising or just playing…so we run into each other more. Then after a few minutes it turns into an invite to the back yard…for a couple of beers, maybe a snack or two…it’s my favorite time of year. Grab a few beers and light up the grill? 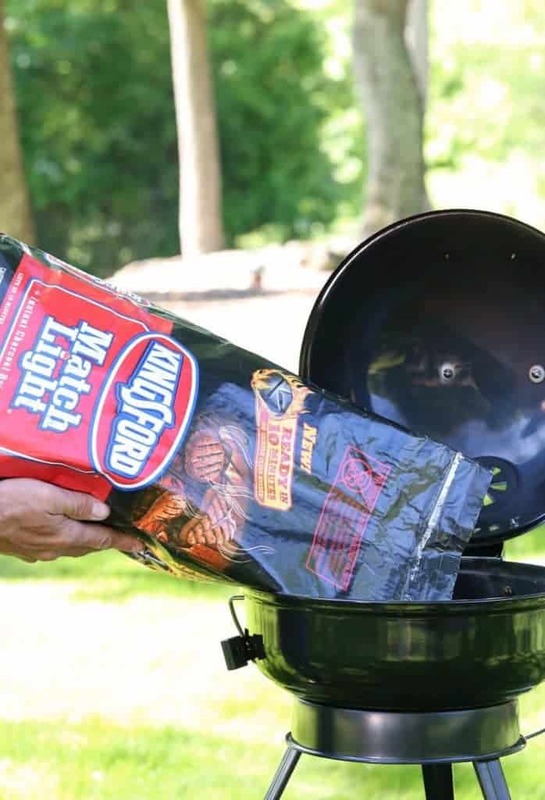 That’s the perfect time for me to grab Kingsford® Instant Light Charcoal because your grill is ready to go in 10 minutes. This time of year I always have burgers and hot dogs in the refrigerator or freezer ready to go, so it’s just time to come up with a side dish today…something that I can get right on the grill and cook as quickly as a hamburger so there’s no waiting around for dinner. And when it comes down to these neighborhood flash parties…you have to think quick. 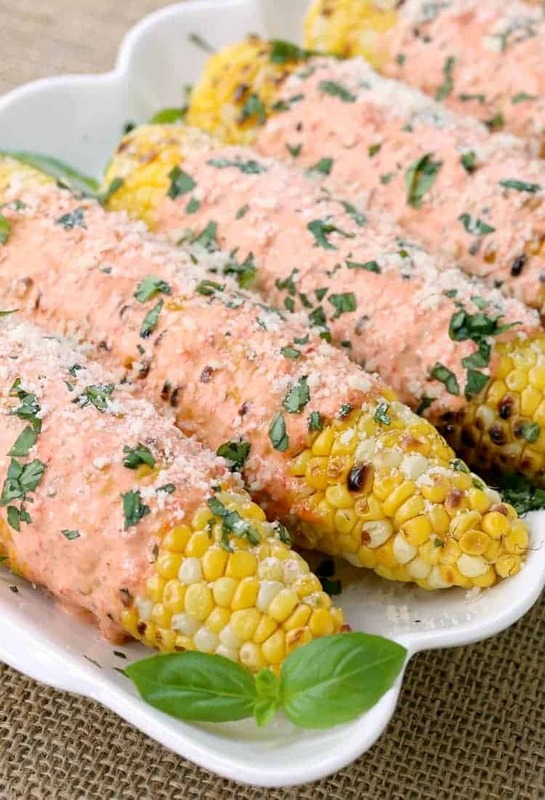 I came up with this Grilled Italian Street Corn to go with our burgers – charcoal grilled corn flavor topped with a roasted red pepper mayonnaise, fresh basil and parmesan cheese. We always try to keep a stocked fridge no matter what time of year it is because you never know when you’ve got to pull out a few beers and throw something on the grill for a last minute stop over by family or friends, so when I’m out shopping at Walmart I grab Kingsford® Instant Light Charcoal and whatever snacks and food I think I might be needing one day soon. 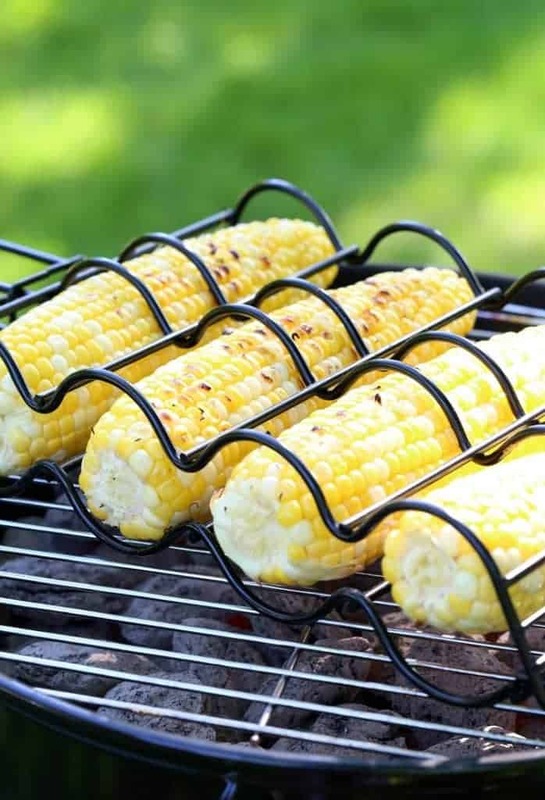 This Grilled Italian Street Corn cooks up in just a few minutes, it’s pretty cool because when it’s toasting on the grill it really starts to smell like popcorn – that smell combined with the charcoal grill is pretty amazing. 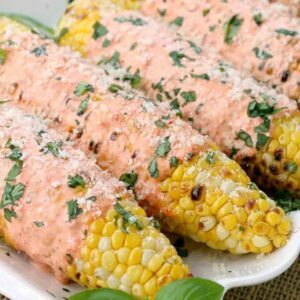 Once the corn comes off the grill you slather it with a roasted red pepper mayo – which is literally just roasted red peppers and mayonnaise blended together – then cover it with grated parmesan cheese and fresh chopped basil. I’m telling you, it’s crazy good. 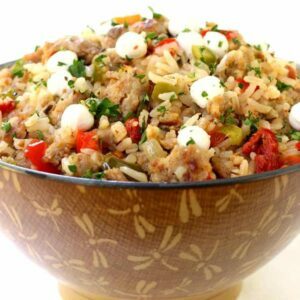 A side dish that will blow your friends minds, they won’t believe that you could just throw something that amazing together without any planning. I’d love to hear about you last minute recipes and so would Kingsford! 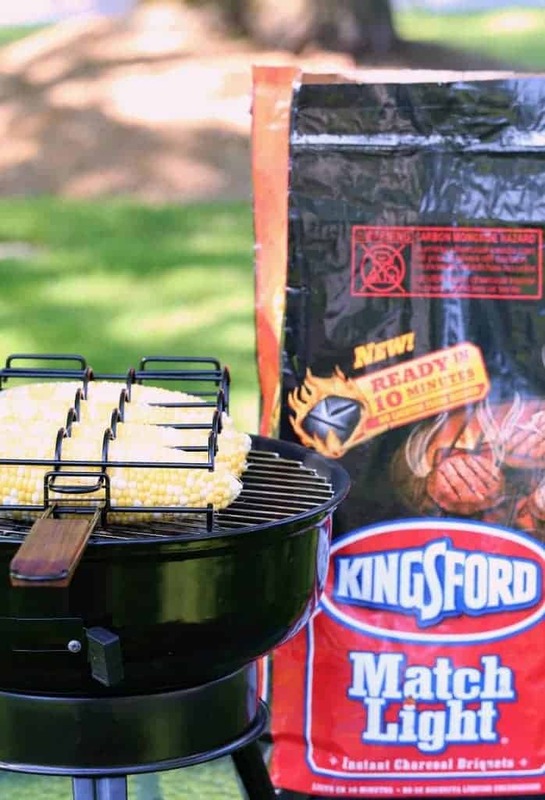 Tag Kingsford in your pictures on Facebook, Twitter, Instagram and Pinterest to be entered to win a free barbecue kit! Get your grill going and tag @coalgrilling on Pinterest, @KingsfordCharcoal on Facebook and @Kingsford on Instagram and Twitter. And let the summer fun begin! Prepare a charcoal grill to medium heat. Place the mayonnaise and roasted red peppers into a food processor and pulse until combined. Grill the corn on all sides, about 10 minutes total until the corn is toasted. 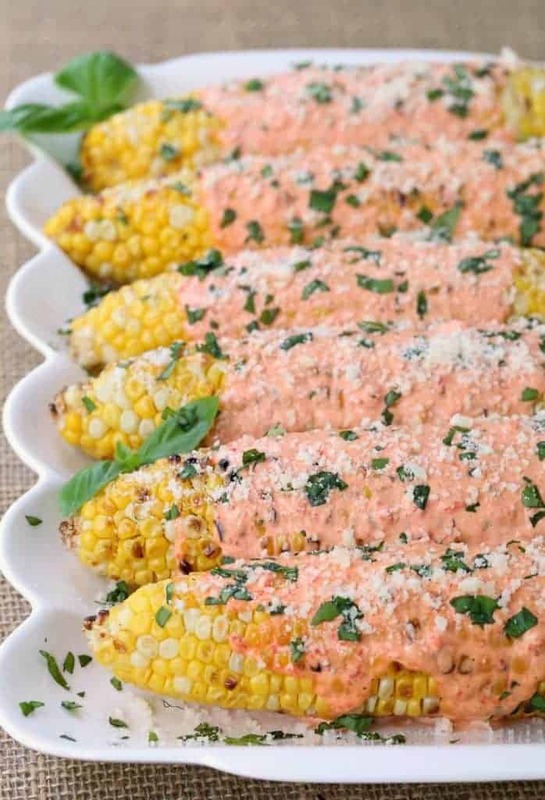 Remove the corn from the grill, let cool slightly and coat with the red pepper mayonnaise and place on a platter. 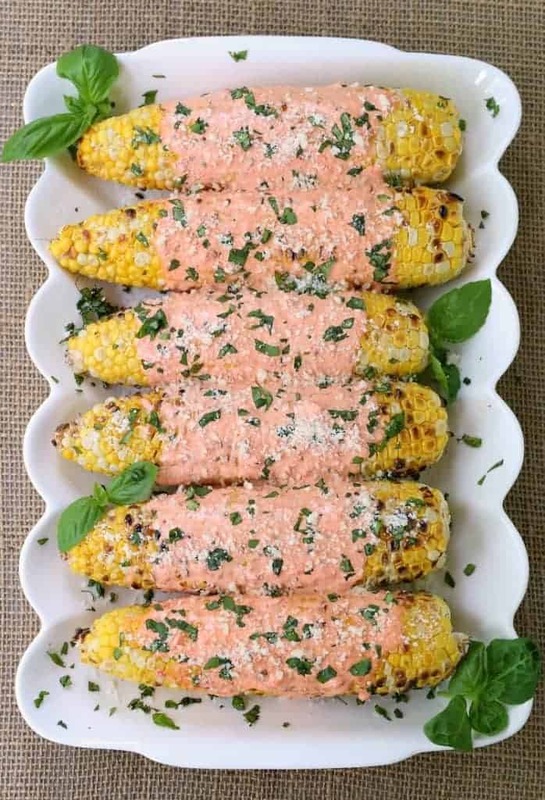 Cover the corn with a good layer or parmesan cheese and then the chopped basil. If you have any extra mayonnaise left over it’s great for sandwiches! Thanks Nicole! 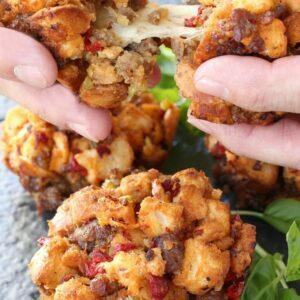 We really liked this recipe too, let me know if you like it!